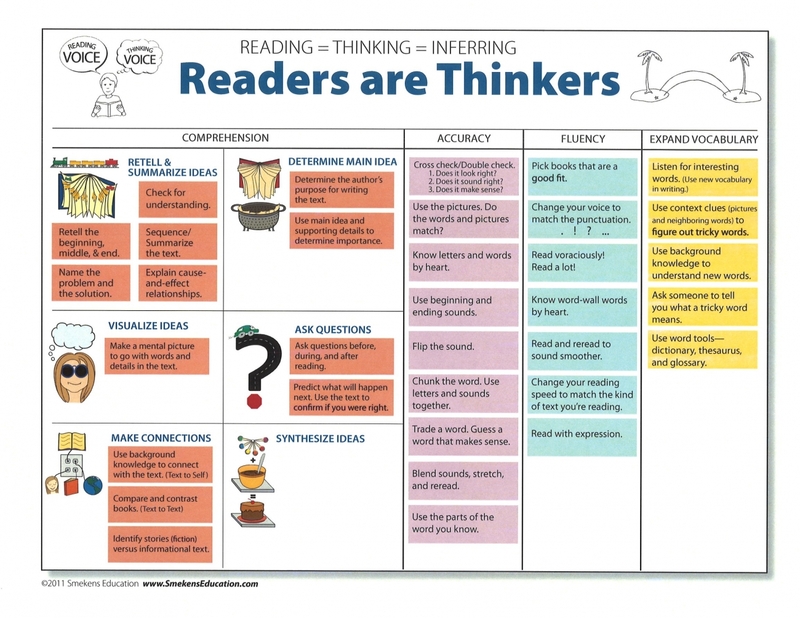 Readers determine the main idea(s). 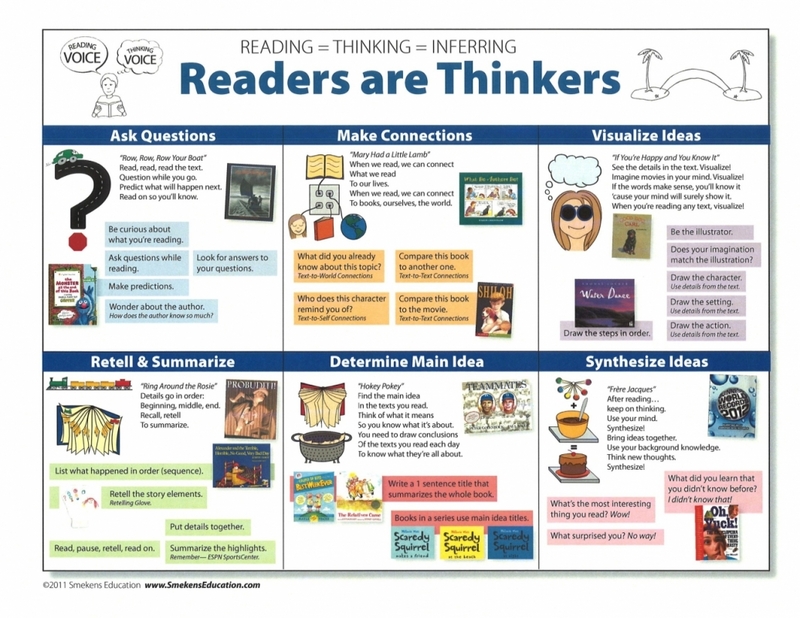 Readers make connections across texts. Thanks to all who have generously shared their creative ideas! 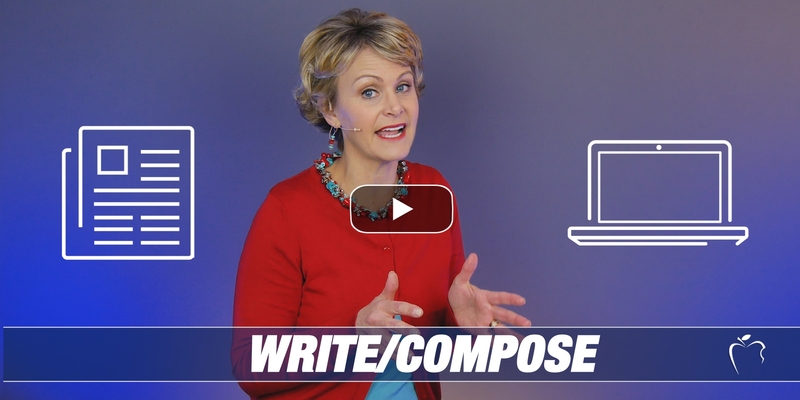 If you would like to share digital photos of your comprehension-strategy introduction, email Kristina Smekens. 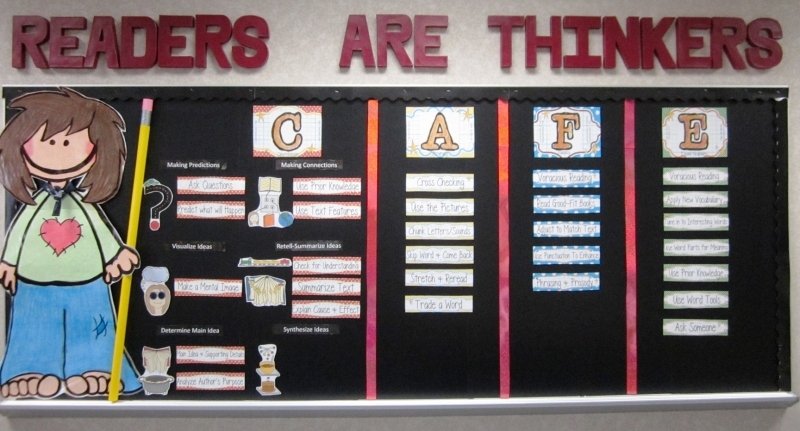 South Creek (Indianapolis, IN) kindergarten teacher Julie Butz put her bulletin board (pictured below) on the wall adjacent to her classroom library and directly behind her teacher chair. 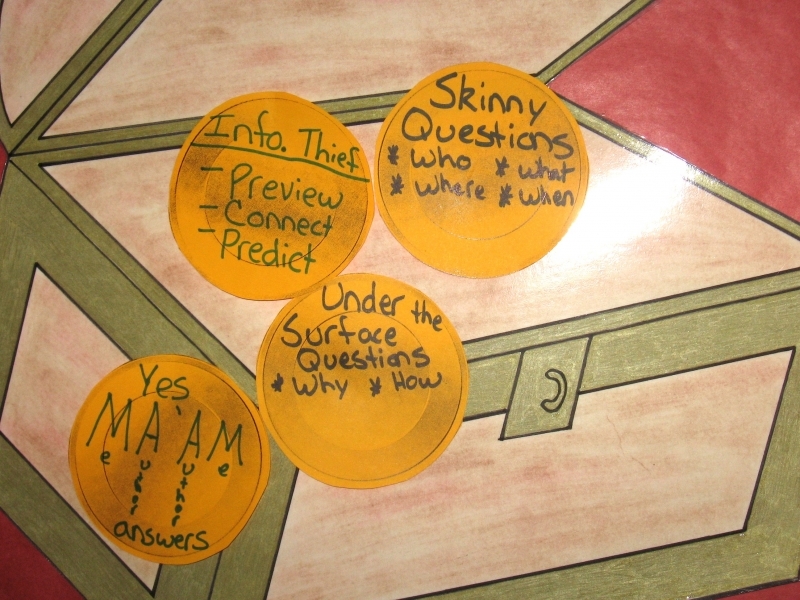 This location made it easy for her to refer to during whole-class comprehension lessons. Her theme utilizes the well-loved Mo Willem's An Elephant and Piggie picture book series. 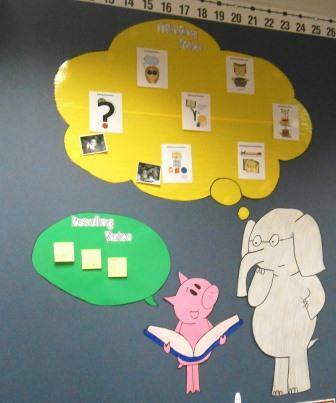 Piggie models the Reading Voice, and Elephant models the Thinking Voice. Throughout her lesson series, Julie added the comprehension strategies to the Thinking Voice bubble and the functions of the Reading Voice bubble. Just below the characters (not visible in the picture), is a backpack on a hook filled with her comprehension manipulatives. This allows her easy access when teaching new skills. 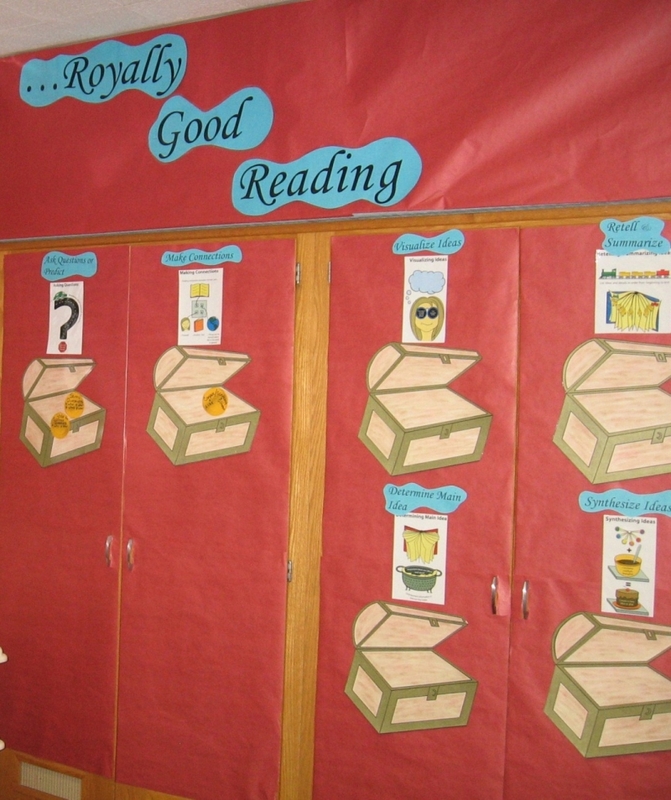 Without a spare bulletin board, South Creek Elementary (Indianapolis, IN) teacher Nichole Webb utilizes the fronts of her cabinet doors (pictured below) to display the comprehension strategies she taught her kindergartners. With each strategy Nichole introduced, she also taught her students to corresponding comprehension motion and read a relevant picture book. Because the display was low and accessible, Nichole said the students enjoy being able to walk over to the area to look at the posters and examples added after the mini-lesson. Notice also how she grouped all the comprehension thoughts under inferring--emphasizing they all require background knowledge and thinking. The display started blank. 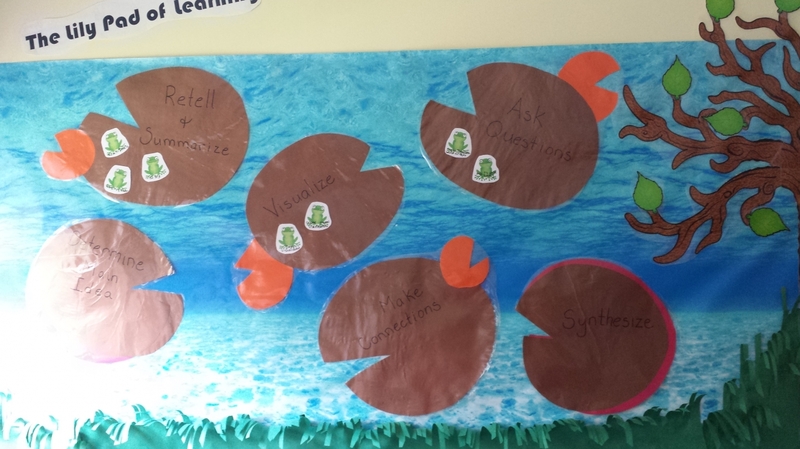 During a two-week lesson series, Melissa built the display. 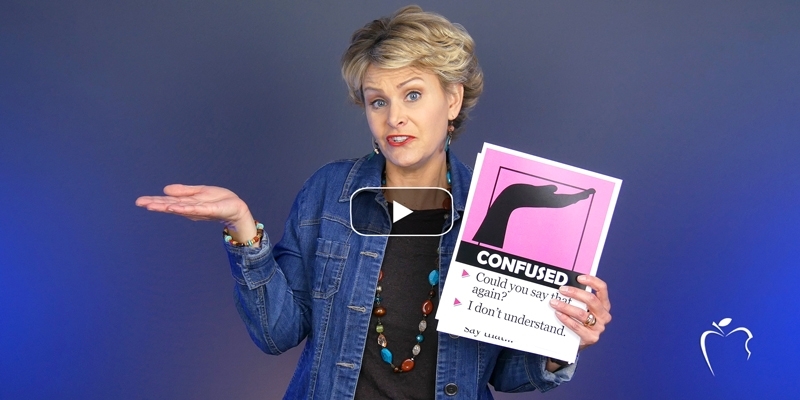 As she introduced each comprehension strategy, she defined it, revealed a graphic icon, modeled its thinking, demonstrated the comprehension motions, and taught her students the song lyrics. What a content-rich bulletin board! What is really great is that Melissa has made this board mobile. Not only can it move throughout the room, but it also can be turned around to reveal the math content being taught on the other side. 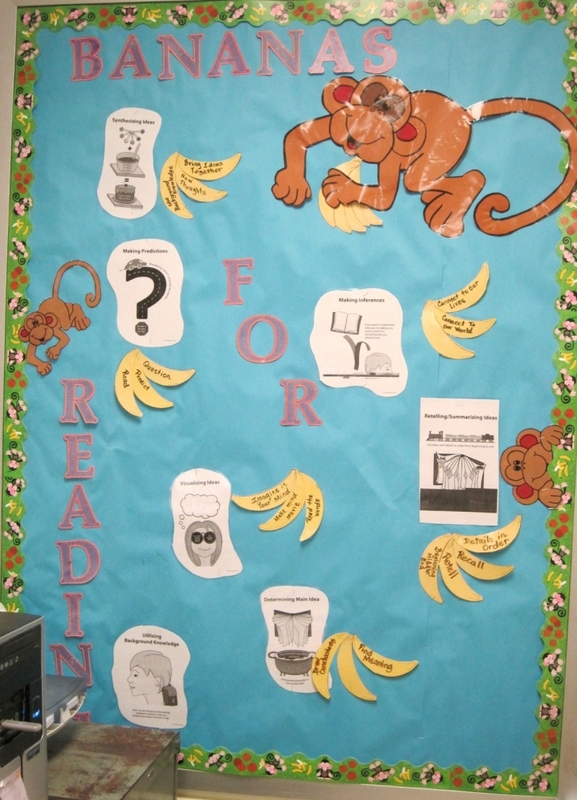 First grade teacher Donna Stant established a "Bananas for Reading" comprehension bulletin board within her Triton Elementary classroom (Fairland, IN). After introducing each comprehension strategy with the graphic icons, Donna spent the rest of the year teaching specific mini-lesson skills. 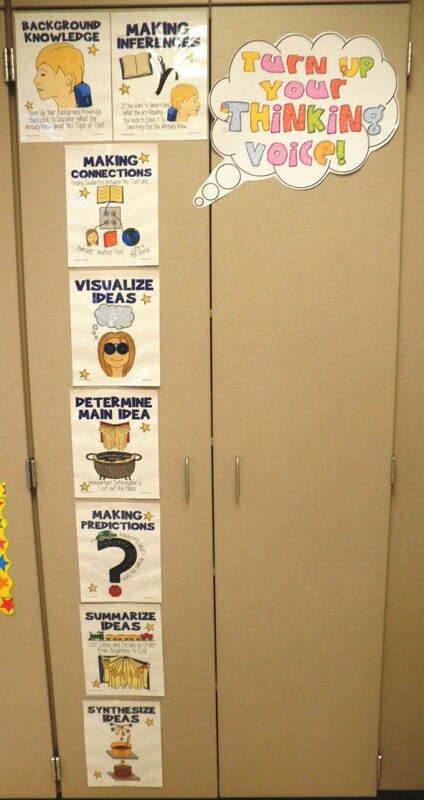 Each of those skills was written in kid-friendly language on a "banana" and added near the strategy it applied to. 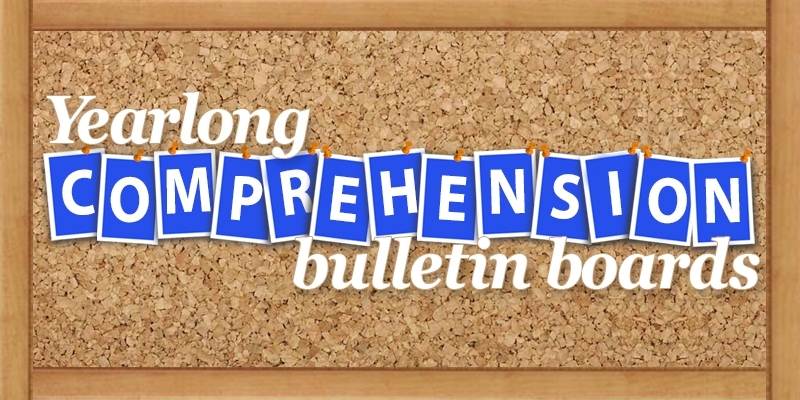 Kristina Smekens describes how she introduces each comprehension strategy early in the year and adds an umbrella to the bulletin board. Then, as the year continues, she provides explicit mini-lesson instruction on smaller skills for each. 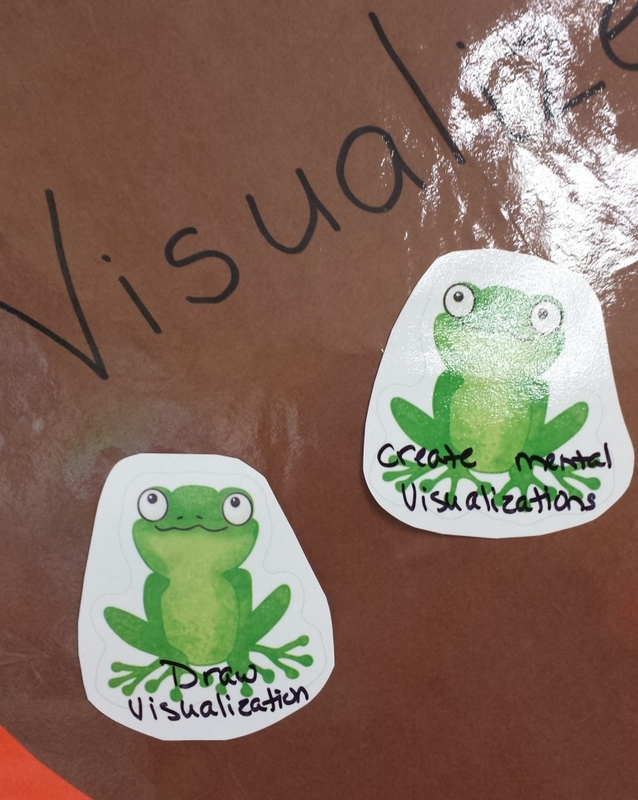 These inpidual skills are modeled, practiced, and added as raindrops to the yearlong bulletin board. 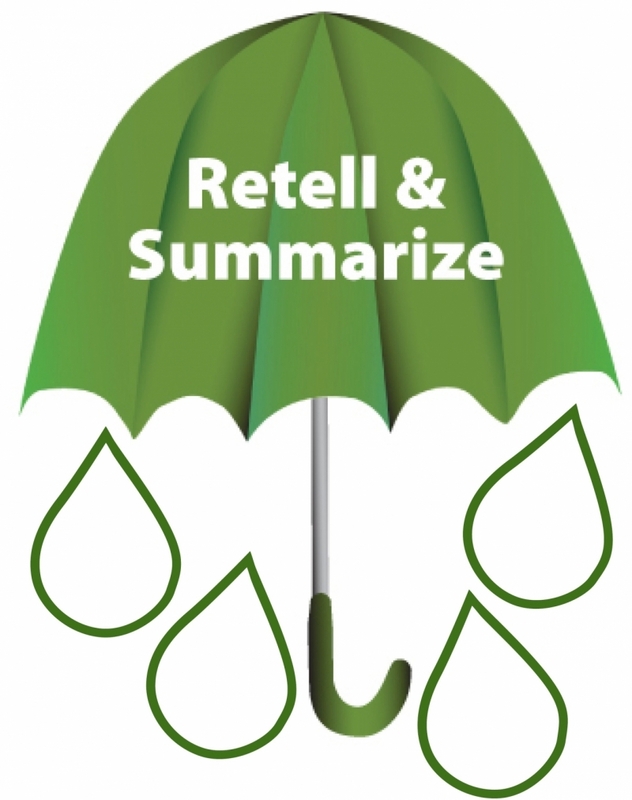 Download the 8x11 mini-posters of each comprehension strategy depicted on an umbrella. Download coordinating-colored raindrops for each umbrella. Download a sample listing of raindrop skills to teach throughout the year via whole-class mini-lessons. 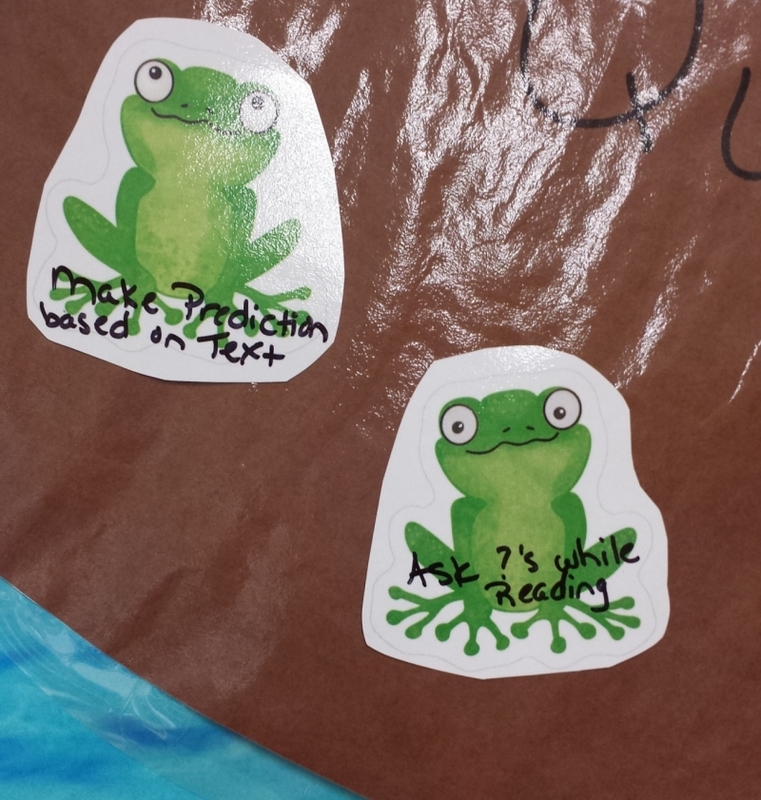 Beth Salvo, second grade teacher at St. Matthew School (Indianapolis, IN) uses a lily-pad bulletin board to highlight all the "frog" comprehension skills she wants her students to learn through the year. During the summer, Beth poured over the standards to determine which skills to focus on and wrote those skills on the frogs she'll add to the lily pads, one at a time. 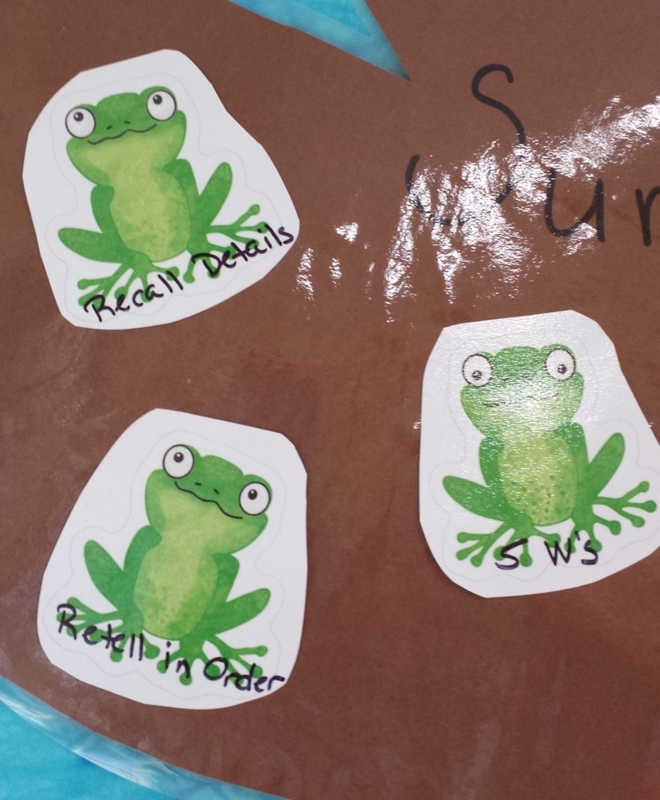 As she presents each skill, a new frog "jumps" on the scene. 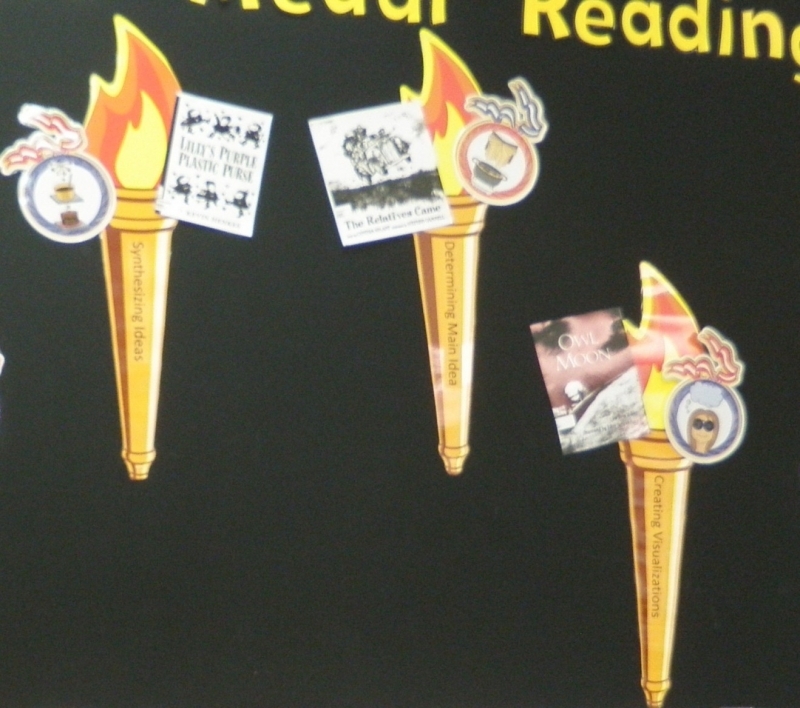 With a nod to the 2012 summer Olympics, second grade teacher Sarah Bottos at Flint Lake Elementary (Valparaiso, IN) created a "Gold-Medal Reading" yearlong bulletin board. She added an Olympic torch for each reading comprehension strategy. 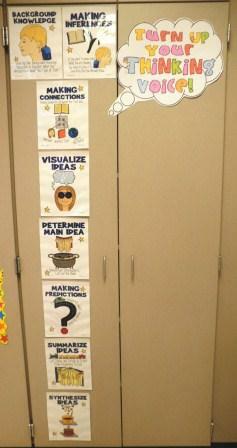 In addition to the graphic icons, she also included images of picture books that she read to model her Think Alouds. 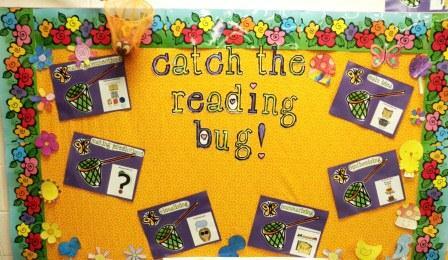 Flint Lake Elementary (Valparaiso, IN) second grade teacher Erin Blumenthal wants to encourage her students to "catch the bug." Also from Flint Lake Elementary (Valparaiso, IN), Erin created a colorful, buggy display highlighting the reading comprehension icons on a bulletin board with plenty of room for growth. 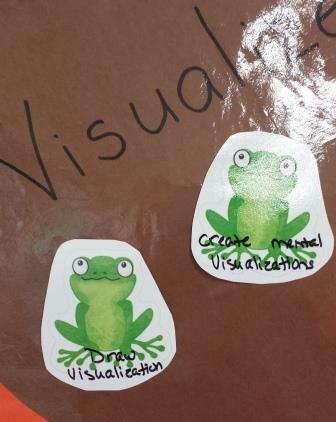 Jennifer spent two days introducing each strategy (using an icon, picture book, visual, comprehension motion, and activity). Her bulletin board will continue to grow as she reviews and teaches additional skills. 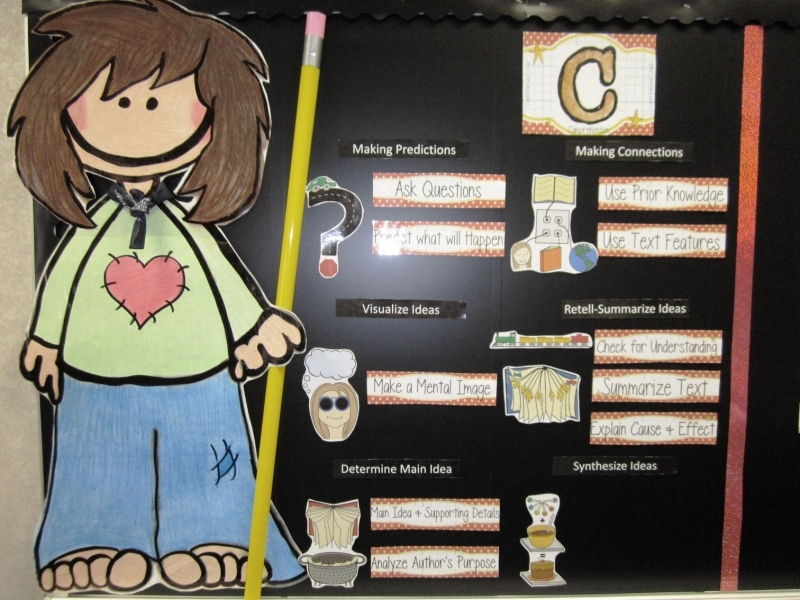 "We are constantly referring to the bulletin board and using the strategies in other subjects (science, social studies, writing, etc.). My students are really using the bulletin board." FYI: Jennifer also created little Reading and Thinking Voice cards within plastic name tags that her students wear during Literacy Work Stations (e.g., classroom library station, buddy reading station, leveled library station, etc.). 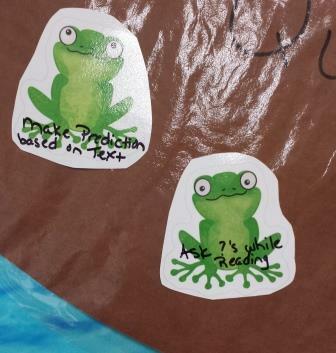 Students flip them over when they are using either their Reading Voice or Thinking Voice while independently reading. 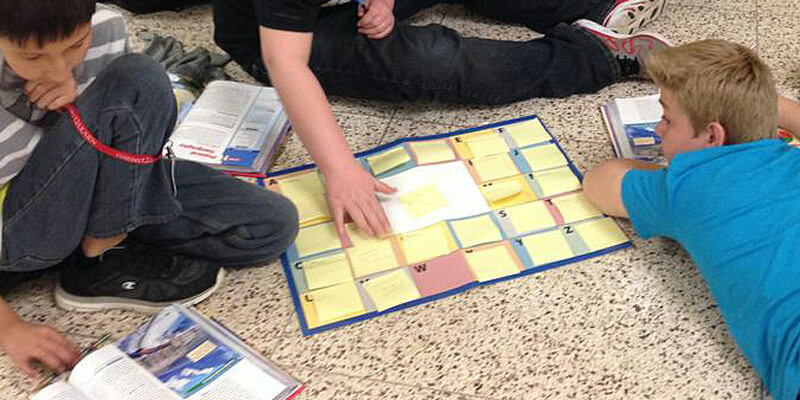 Intermediate teacher Elayna Leas used a castle theme to roll out the comprehension strategies to her Sweetser Elementary (Sweetser, IN) students. With every comprehension strategy she introduced at the beginning of the year, she added a treasure chest. 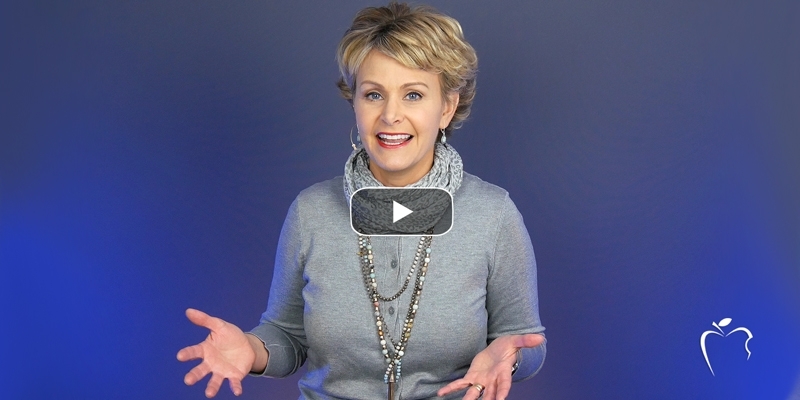 She spent 2 days introducing each strategy and had them all up and running in less than 3 weeks. As the year progressed, she taught mini-lesson skills and wrote them on "gold" coins.These coins are then placed in the corresponding comprehension treasure chest. Her students are slowly watching the skills grow as those coins increase. Elayna said that putting the skills/coins within each treasure chest has helped the students understand reading in a new way. "I feel like they can place skills on the right shelf within their minds. 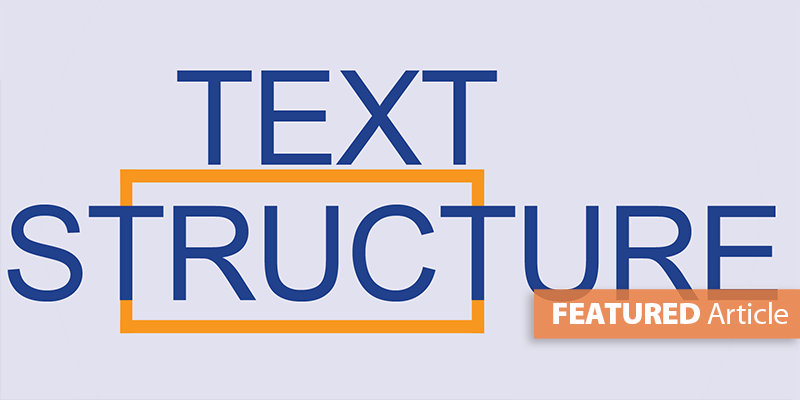 For example, when teaching figurative language, I am not sure that students previously understood why they needed to understand what figurative language meant, but when teaching it as a part of the visualization strategy, now it makes sense." Teaching her students that inferring requires reading the words and thinking about what they mean, Melanie Laurent created a comprehension bulletin board for her young readers at the Loveland Early Childhood Center (Loveland, OH). As she introduced each comprehension strategy, she modeled the thinking required using a picture book. Those initial lessons concluded with her adding the comprehension "tree" and icon for each. As the year progressed, Melanie revisited each strategy, adding more specific information and sub-skills related to each. Those specific skills are what she writes on the color-coordinated leaves. Depending on what skills she is targeting, Melanie adds new leaves every couple of weeks. 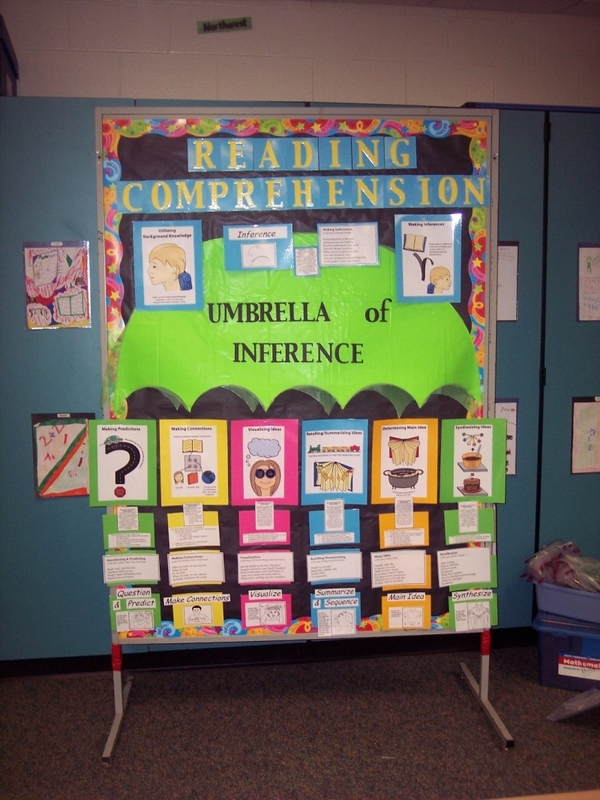 Fourth grade teacher Tracy Christman at Westlawn Elementary School (Dunkirk, IN) highlights the comprehension strategies within her Reading is Thinking bulletin board. 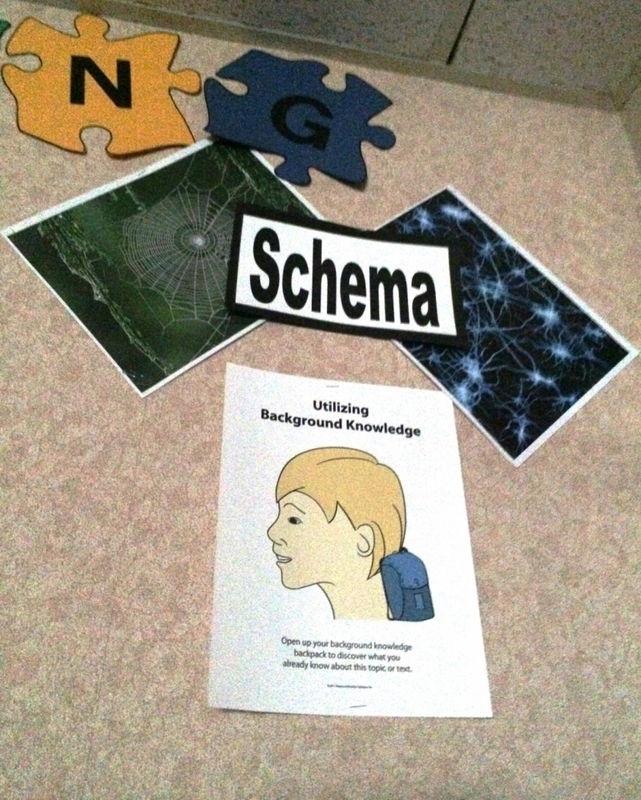 Each strategy includes the icon image as well as handouts and other resources that go with each strategy. 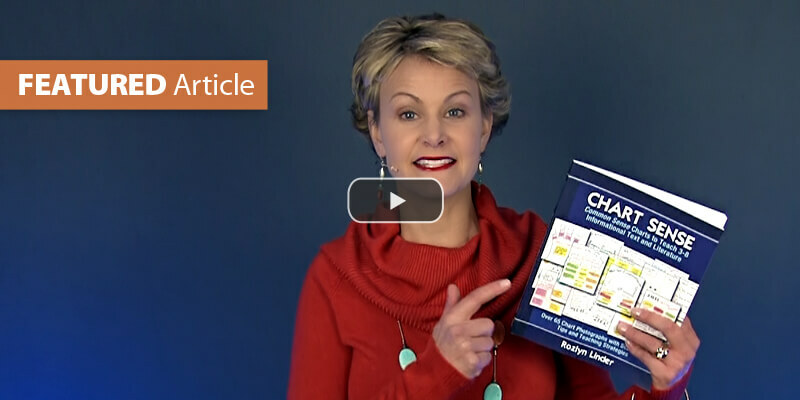 Tracy adds the extra resources (e.g., definitions, handouts, images, etc.) as she spirals through the skills in mini-lessons during the year. 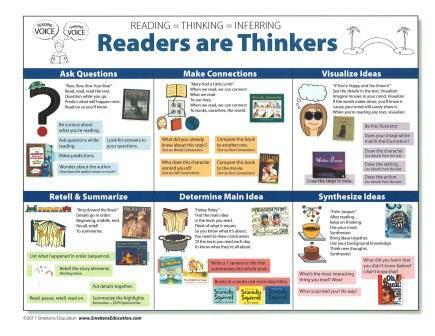 The board acts as a reminder for students of the skills they are expected to utilize during reading. 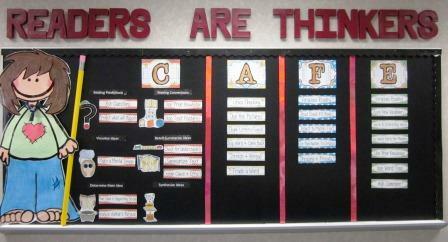 For those who would prefer a growing bulletin board that does NOT include any theme, here's a simply approach. 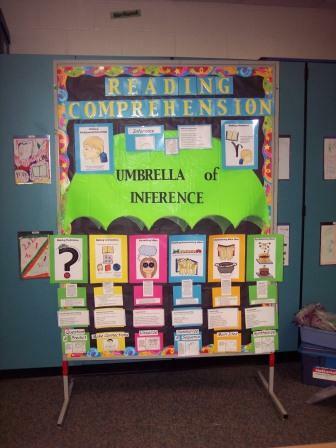 Notice how "Inferring" is part of the title of the bulletin board, as it's simply a synonym for thinking. 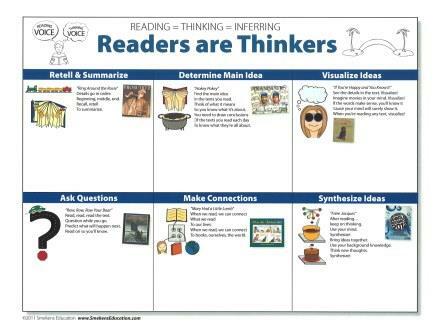 Then each comprehension strategy has its own section, including the graphic icon, corresponding song lyrics, and a photocopy of the cover to a picture book read during the initial mini-lesson. 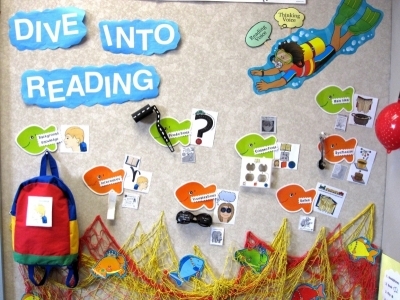 As the year progresses, inpidual reading skills are taught in whole-class mini-lessons and added to the growing bulletin board. Notice also how additional mentor text was read to model these new thinking skills. For those attempting to mergewith their Daily 5 C.A.F.E. 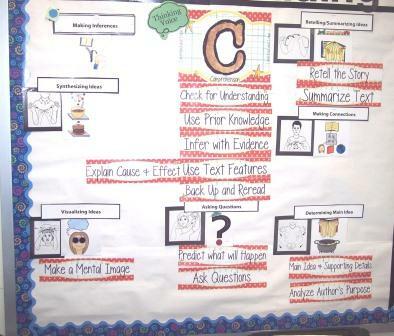 board, check out what Nadine Gilkison created in her fourth grade classroom at South Creek Elementary (Indianapolis, IN). 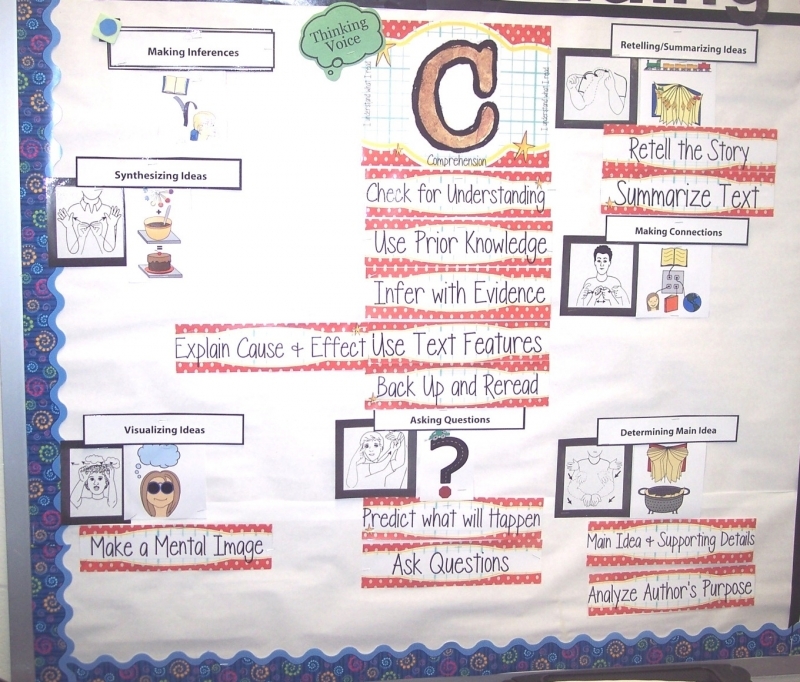 By devoting extra space to the C portion (the "Comprehension" section), she was able to add the comprehension icons and key skills. 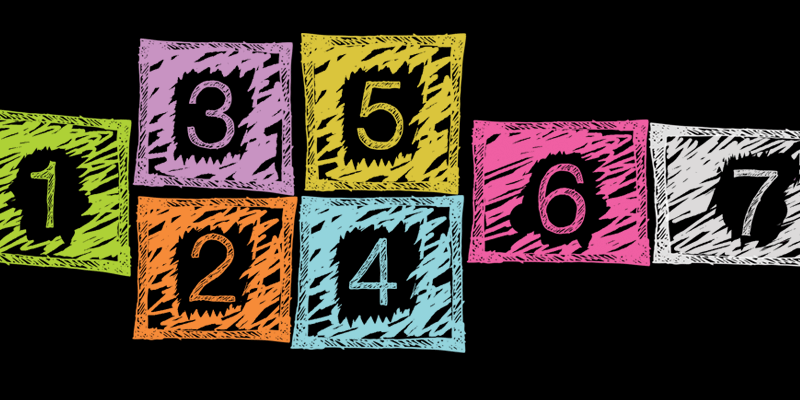 Here's a second version of the "Comprehension" section of a larger Daily 5 C.A.F.E. board. This one was created by Kelli Ormes, from Mary Adams Elementary (Indianapolis, IN). It includes visuals of the Smekens icons and Dr. Block comprehension motions . For a more complete list of potential "Comprehension" skills under the "C" section, here is a digital version. I appreciate your creative concept.. I might try some of them perhaps... 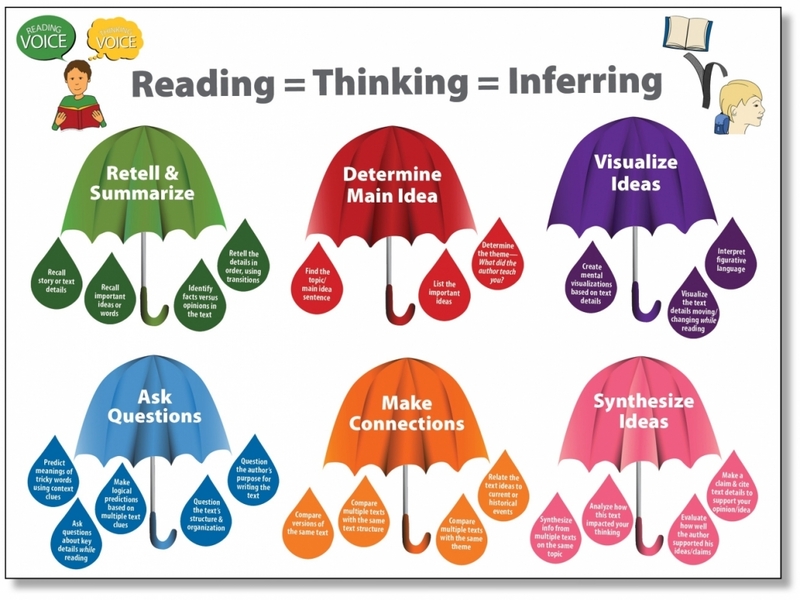 Thanks for sharing ..
Making an inference is a result of a process. It requires reading a text, noting specific details, and then putting those details together to achieve a new understanding.